Jadielady: And now, for something completely different! I'm attempting my first socks! I like the recipe, because the only time you count is for casting on! I'm not a fan of row and stitch counting. But, I'm also not a fan of stockinette stitch, unless I can do it in continental, which I haven't been able to figure out with DPN's yet. 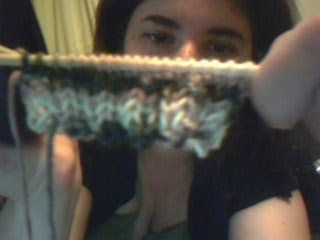 Because I've got small feet, and I'm using medium weight Socks that Rock, and Size 3 dpns, I cast on fewer stitches... I started out with 48, but it didn't look like enough, so I decided to try 60. We'll see how it goes! Socks!!! I understood "socks" in that entire blog. *Woot* I think you're making socks!!! Great job so far..Socks are fun! I only started about a year and half ago, but became totally addicted at first..I've recently lost my sock mojo, but I'm sure when fall returns, it will show up. 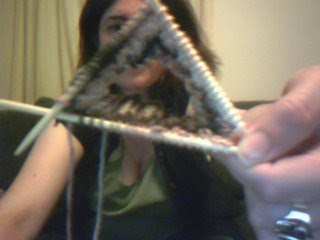 The STR yarn is just awesome!..that in itself is addictive!